In the photo are, kneeling from left, Michelle Moore (C-STEP coordinator), students Michelle Ferraino, Alexia Brunetto and Jordan Colley; and standing, Amanda Cuccinello (Townsend Leather), Students Michael Brown, Nitara Jackson, Breanna Viscosi, Joline Hall, Laurie Lazinski (assistant professor), Student Tyler Hart, Taslim Yousaf (Townsend Leather), and Pamela Goldswer (Townsend Leather). 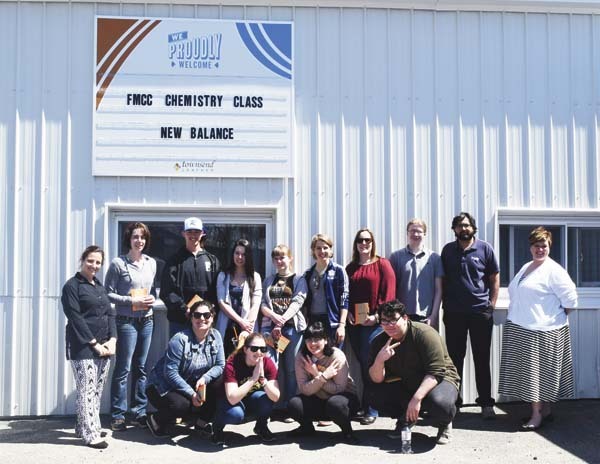 JOHNSTOWN — On Tuesday, Fulton-Montgomery Community College General Chemistry II and C-STEP students, along with chemistry Assistant Professor Laurie Lazinski and C-STEP counselor Michelle Moore, went on a tour of Townsend Leather in Johnstown. Lazinski said the tour was also to demonstrate to the students the complexity of leather manufacturing. “A lot of problem solving is involved to dye the leather to the customer’s specifications. It’s important for our students to see and hear this so that they know what will be expected of them when they enter the workforce,” Lazinksi said. The FMCC staff and students were also for the opportunity to participate in the off-campus learning experience.